Kalamata is known for its olives and traditional folk music and dancing. The Greek city is also where Sokratis Papastathopoulos was born, though the none-shall-pass philosophy of the Borussia Dortmund centre-back means any opposing forward who tangles with him is unlikely to lead him a merry dance. The former Werder Bremen man featured in 43 of Dortmund's 48 competitive fixtures in 2017/18, a clear indication of the central role he has carved out for himself in five years at the Signal Iduna Park. When he arrived — on the eve of Dortmund's UEFA Champions League final with Bayern Munich in 2013 — he was anything but first-choice. Mats Hummels and Neven Subotic had been the almost impassable barrier that had taken Dortmund to back-to-back Bundesliga titles under Jürgen Klopp, and the new arrival was very much the odd-man out of the centre-back trio. Watch: Sokratis' Top 5 tackles! Not that the challenge fazed Sokratis, who had enough self-belief to feel he could muscle his way into the team in the same way he uses his strength to keep opponents at bay. "Money didn’t play a role in my decision to join Dortmund. My own future was all that mattered and I’m convinced that I made the right decision," the then-24-year-old told Sport Bild. "I chose Dortmund because I’m confident that this is the right step in my career. I had to make a professional decision and I see Dortmund as the best step in my development." Fierce competition for places had not stopped him making headway before. Traianos Dellas, part of Greece's legendary UEFA EURO 2004-winning squad, barred his route to the AEK Athens first team as a youngster, yet Sokratis would become the club's youngest-ever captain, at 19, and his country's Young Player of the Year in 2008. A switch to AC Milan from Genoa in 2010 upped the ante considerably with Alessandro Nesta and Thiago Silva among those ahead of him. Although he was not able to scramble in front of the big-name duo in their Rossonero hierachy, coach Massimiliano Allegri was sufficiently impressed to now reportedly be considering bringing Sokratis to Juventus. With Arsenal boss Arsene Wenger, Manchester United manager Jose Mourinho and Chelsea chief Antonio Conte also said to be on the list of admirers, the forward strides Sokratis has made since he left the San Siro have been giant ones. Though he did not fully establish himself as first-choice until Thomas Tuchel's arrival in 2015, his first two campaigns with Die Schwarzgelben still brought 43 starts and a formidable 66 percent of challenges won. His promotion came at the expense of Subotic, and since the 2016 departure of Hummels for Bayern, Sokratis has been the undisputed general of Dortmund's rearguard action, a billing he has lived up to famously. His 69 percent 'challenges won' ratio this season has been a major part in helping BVB enjoy a clean sheet tally in double figures, an admirable achievement given the gung-ho nature of his team, particularly under Peter Bosz. In the top 10 for touches this season — level with Naldo and just behind Hummels — Sokratis' 90 percent pass completion means he is just as important in getting his own side moving forward as he is in stopping BVB's rivals doing the same. And it is not just because referees fear writing his full name — Sokratis Papastathopoulos — that he has received just three five cards this season as his play includes more finesse than his nightclub doorman 6'1" frame would suggest. Watch: Can anybody spell P-A-P-A-S-T-A-T-H-O-P-O-U-L-O-S?! Skip to 2:20 to find out! He is ideally suited to teams that love to attack simply because he loves to defend. "The defensive work that Sokratis puts in is just unbelievable," stated Hummels admiringly when the pair were still playing together. It says a lot that Otto Rehhagel moved Sokratis up into midfield so that he could man mark Lionel Messi at the 2010 World Cup, and though his voice is rarely heard, the defender not only leads by example but speaks up when necessary, such as when Ousmane Dembele engaged in his tug-of-war with Dortmund last summer. "Ousmane has given us a lot, he can make the difference in games. We need players like that. 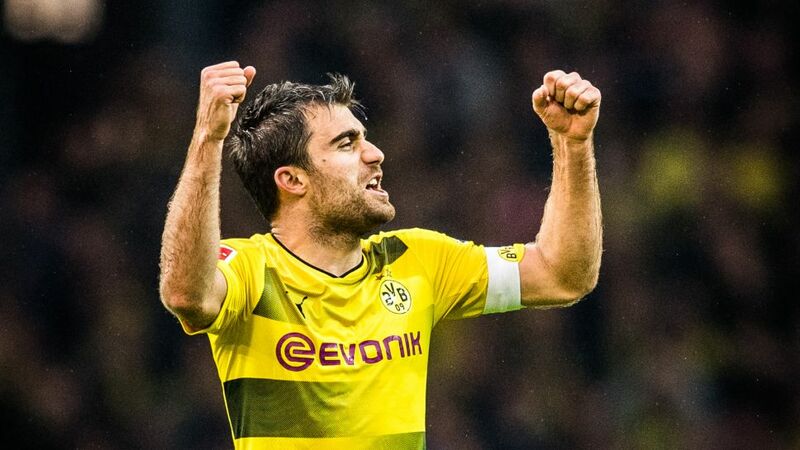 But we also need players who don't step over the line and want to be part of our family," declared Sokratis. "He must understand that no player is bigger than the team. Everyone has to understand that they work for the team and have to fit in with that." That was advice for his young team-mate, but it is also a philosophy Sokratis himself follows, because he not only talks the talk, but — like all those from Kalamata — he also dances the dance.